These are some of the notes presented by Brian James at last spring’s PGC/Glazier Basketball coaching Clinic in Chicago. Brian is an assistant on the men’s staff at Northwestern. If you want the best in basketball education, then you need to attend the PGC/Glazier Basketball Clinics this Spring! They’ve changed the coaching clinic game forever with more topics, superior speakers, and a staff pass that includes unlimited coaches from your school. Start and finish behind baseline. Score the layup before finishing across the baseline. Each player goes twice one way and then twice, going the opposite direction around the cones. When posting, straddle the line above the block–that allows for baseline cut by passer. Post players need 3 moves–a go to, a counter, and one other. Work in pairs to push each other. When a post player is guarded by a bigger player, he/she should turn and face the defender. 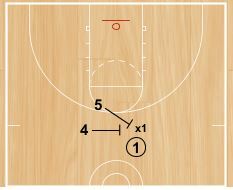 Get to the middle of the lane and look to utilize a spin move. You will want to change the drills/spots to fit your needs, but have a standard that they must meet before moving onto the next drill or spot. Shoot 2 free throws after making 5 of 7 and before moving on to the next spot. Work against air dummies or EAT pads. 3. 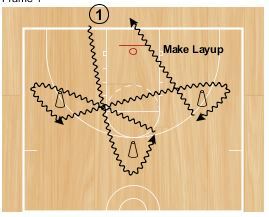 Transition Drag Screen and Pop or Roll Shooting Drill. They teach their post players to pop their feet when they land when setting a ball screen to avoid moving and illegal screens. That also cues the dribble to use the screen. Note: Northwestern likes to set their drag screens like the 5 screen in the diagram, not the 4 screener. They feel it helps their guard with the basketball get downhill quicker. 4. 3 Post Moves for each player (go to, counter, third move). These moves are individualized to each player’s strengths. Here are some additional notes on improvement season skill development from Tom Richardson, Men’s Assistant at Vanderbilt from the Chicago PGC/Glazier Clinic. 1. Work on agility, balance, conditioning, quickness, speed, and skills. 2. 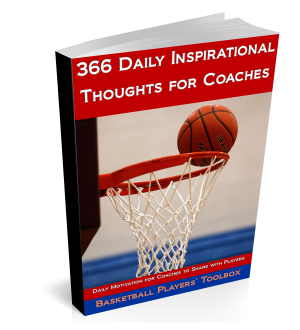 You should work on skill development during the practice and games season, but in the improvement season (April-September) you should use drills that you don’t use in practice to avoid boredom. 3. Out of season workouts cannot be boring for the players! Keep them quick paced, high intensity, and high energy. 4. Conduct a shooting assessment as a “pre-test” at the beginning of the workouts, then measure periodically to determine improvement.